We love sandwiches . We love grinders , subs , hoagies and the " slap some ham between 2 slices of bread " sandwiches we make at home . But mostly we love ...what we call ....GOURMET sandwiches . You know ....those sammies with that something special ......fresh baked bread ....freshly carved meats and cheeses ....tasty homemade spreads . Ummmmmmm And surprisingly , two of the very best are from one tiny place .......Tiverton , RI. BLACK GOOSE CAFE is right on Main Rd. in Tiverton , situated right across from NANAQUAKET POND . Makes for lovely " sandwich-eating " scenery . We've been here quite a few times and have tried quite a few different sammies and have NEVER been disappointed . The fresh breads are made daily , the fresh meats are cut right off the turkey or roast beef etc. , plus the eclectic & tasty spreads ....all make for a terrific luncheon experience . Plus every sandwich comes with a small cup of potato or orzo salad ....home-made and delicious . On one visit Laura had the PARISIAN ....it was a grilled chicken breast with fresh baby spinach , provolone cheese , caramelized onions and an herb-cheese spread on freshly baked bread .She loved it ! 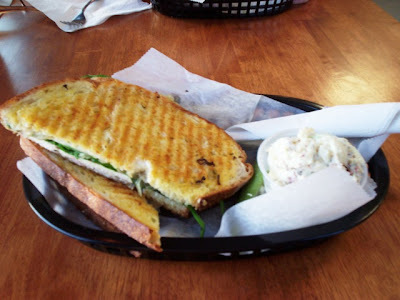 I had the ET TU BRUTE ( they get really inventive with the names here ) which consisted of a grilled chicken breast with thick applewood bacon , fresh romaine lettuce ,shaved Parmesan cheese and a touch of caesar dressing all on home-made country white bread . It was HUGE and delicious . Actually it's my favorite . 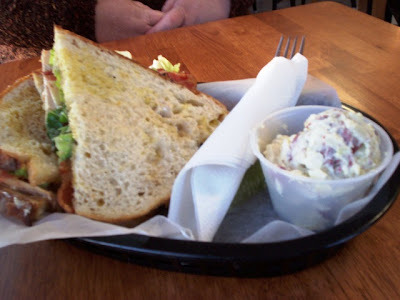 To see more of their fantastic sandwiches and read our FULL review .... just click on the link . PROVENDER is surprisingly ...on the very same street as BLACK GOOSE . What is it with MAIN RD. 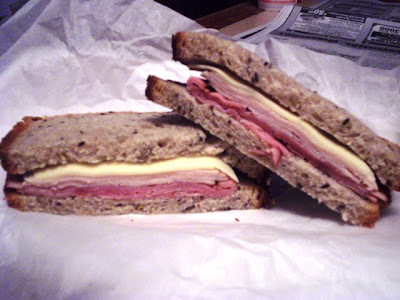 , TIVERTON and great sandwiches ? Actually , PROVENDER is right in the middle of Tiverton's historic " 4 CORNERS " . If you haven't been ....go . It's a lovely ride in the country . Plus , right across the street from PROVENDER is the famous GRAY'S ICE CREAM . Prize - winning coffee shakes .....I've had them ...to die for . There's also a nice assortment of little specialty shops and an antique store . A fun way to spend an afternoon . Now on to the sammies . Provender makes all it's breads fresh on premises ( lots of goodies too ) plus they slice to order all meats and cheeses so everything is always fresh . They have some great sandwich fillings like hummus and sprouts and special mayos ....again everything freshly made . We've been often and are always thrilled with our choices . One excursion found Laura having a " SCARLET LETTER " ( more fanciful names.. lol ). 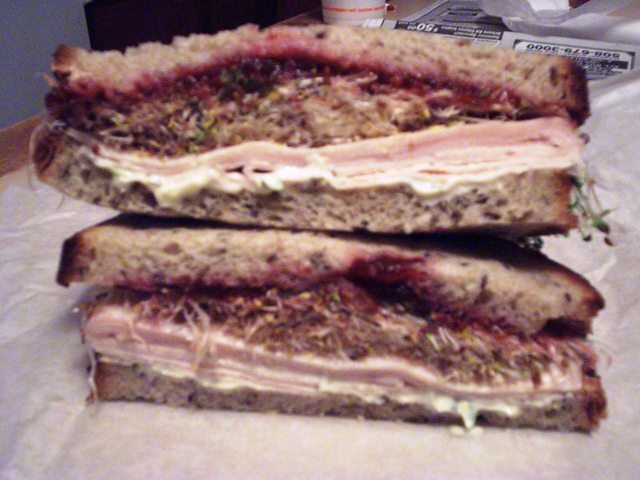 That was a fresh turkey and cranberry on 7-grain bread with tarragon mayo and alfalfa sprouts . It was outstanding . I had a custom -made turkey , ham and provolone also on 7-grain bread and it was filled and delicious . And you just have to get a BIG cookie on your way out . To see their unique selections and our full review ...click on the link . OH YEAH .......VERDICT .......TIE ....Can't decide between these two GREAT sandwich spots . They both put forth SO much extra effort to make your dining experience a great pleasure . Try them both .....you'll keep going back ....just like we do . P.S. - Check out MenuJoy.com for a great list of local area restaurant menus!